Let your tired and sore body get some rest on the Sleep Rest Comfort-Top Plush Mattress. The Comfort-Top creates a hugged sensation with luxury plush top that will conform to your body without compromising support you need for a good night's rest. With pocket coil spring technology you can move independently, meaning you are less likely to disturb your partner’s sleep and keeping both your postures so falling asleep won't be a problem.On top of that you will have a versatile metal base that can be used as a standalone bed or it can be used on top of an existing bedframe. Unlike traditional wooden box springs, the 2-in-1 Bed can be assembled. You don’t need to worry about trying to squeeze it up stairwells and jamming it through the doorframe. As a standalone box spring, just attach the legs and your bed is ready to go, or remove the legs and place it on your existing metal rail frame. Motion Support Technology is an excellent motion separation to ensure that you do not disturb your sleeping partner. Motion Support Technology is ideal for anyone who moves while they sleep or sleeps with someone who does. Pocket Coil Technology Individually pocketed coils provide a sound, undisturbed sleep. Individually wrapped mattress coils, also known as Pocket Coils provides personalized comfort by matching the contours of your body which hugs and cradles your body for optimal pressure relief. Surface Foam Technology features 3cm premium comfort foam layers with an air flow channeled design that creates the optimal sleep environment. 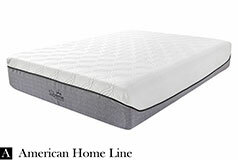 Memory foam layer eases pressure points that cause tossing and turning and sleep disturbances. Tufting Locking Tufting process creates peaks and valleys on the mattress surface keeping the comfort layers and materials locked into place. Since the comfort layers at the top of the mattress provide the most noticeable comfort and support, tufting is an excellent way to ensure that the comfort and support stay uniform and don't shift or diminish over time. 360º Foam Encasement The 360º Foam Encasement ensures that you get edge-to-edge comfort. This foam encased pocket coil spring is totally encased in 3-4 inches of high density foam that wrap around foam enclosure, providing a firm 360º durable and comfortable border with great edge support that extends your sleeping surface area right to the edge of your bed. Comfort-Top Plush Let your mattress give you a hug at the end of a long day with 10cm of additional foam. Collapse into the pillow soft Comfort-Top Plush and enjoy the luxury plush feel hug you all over. This mattress conforms to your body without losing the support you need for a good night's rest. Dimensions Mattress: 60" x 80" X 13"
2in1 Bed & Box spring: 60" x 80" X 8"
Packaging For convenience, this mattress is compressed and rolled in a box so that is easily shipped and set up in any home! Easily moved into any room without difficulty, fits easily around tight corners and up stairs.